Some of Coach's new offerings. Coach’s new lineup of Apple Watch bands are ready to glam up your wrist just in time for winter. The company has come out with a limited number of new straps that add a splash of couture to your Apple Watch without totally busting your bank account. 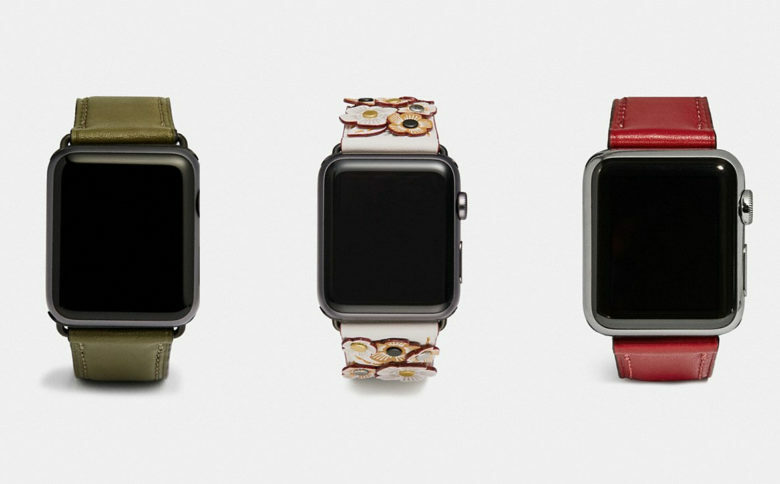 First spotted by Haute Ecriture, the new bands include the Apple Watch Strap with Tea Rose Applique in Chalk ( $175). The new colors include the Apple Watch Strap in Fatigue ($150), the Apple Watch Strap in Jasper ($150), and LT Blush ($150). Some of the models are only available in one size. The Tea Rose Applique and Apple Watch Strap in Fatigue are only available in 42mm while the Jasper and LT Blush options only come in 38mm. Most of Coach’s watch bands only come in limited quantities. There are 200 units of the Tea Rose Applique bands available, 100 Apple Watch Strap bands in Fatigue, 74 Apple Watch Strap bands in Jasper, and 305 Apple Watch Strap bands in LT Blush. If you’re interested in the new bands you can pick them up at most Coach retail stores that carry Apple Watch bands as well as Coach’s online store. If $150 is too pricey for you, check out the Cult of Mac Watch Store band store for tons of fashionable and affordable options.